I have not posted for a while as I have not been well, I have had a bit of a battle with secret men’s business cancer, some good news is that my prognosis is looking good and even though I still have some healing to go I am getting back to normal life. Now for the important stuff. 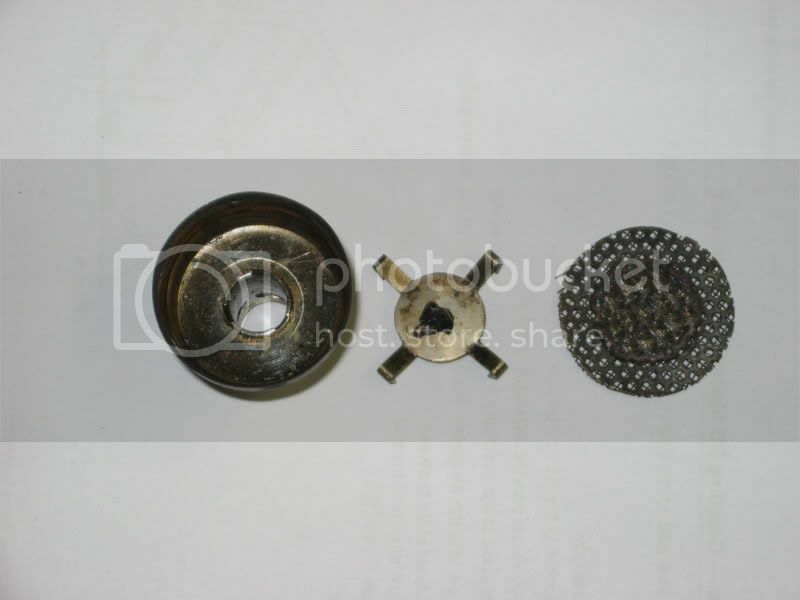 Have you ever wondered what is going on inside of your stoves flame, so have I and for a while now I have been thinking about how to look at this problem so the other day after on and off working on making a flame profile, I finally got something together. 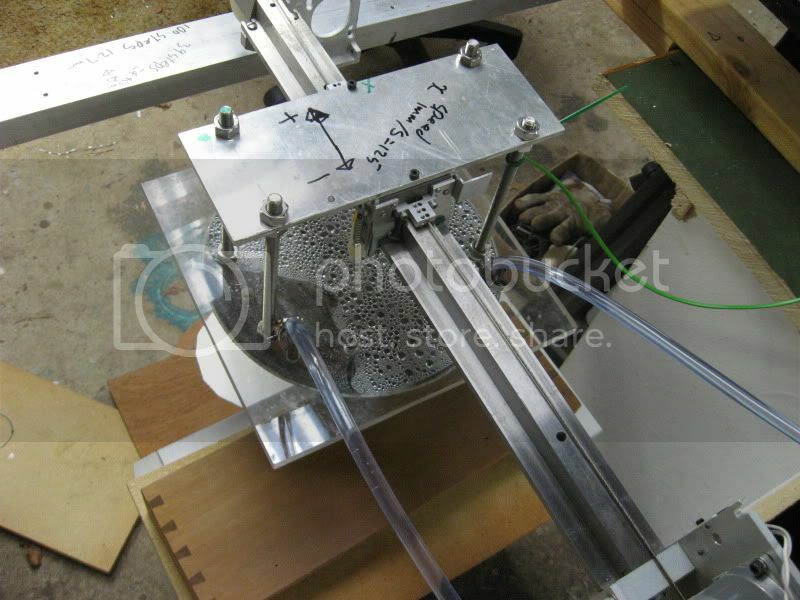 It is a large pot/heat exchanger with a temperature probe in the center, the pot can be moved in an X-Y directions, at the moment I can only do 1D profiles as the profiling test rig needs a bit more development and programming to do 2D profiles but that is not far away. 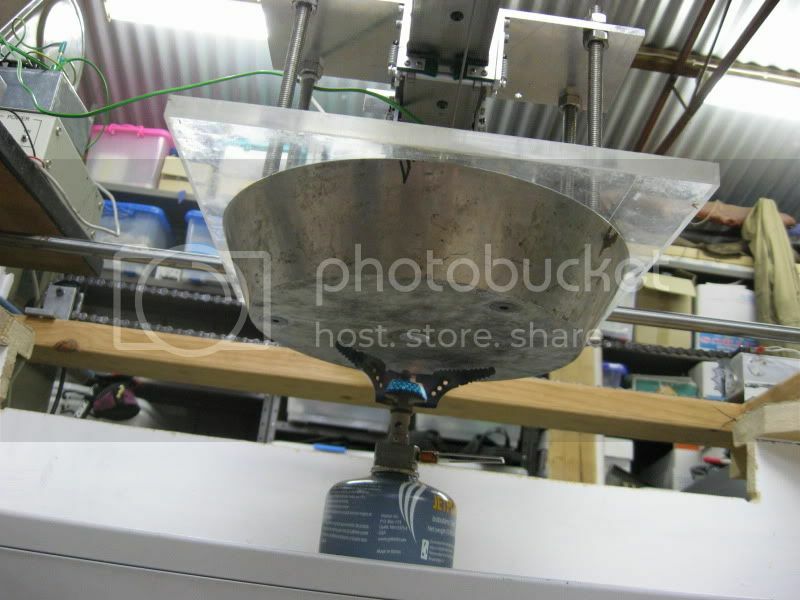 Below are some photos of the profiling rig, the pot has a copper coil running through which with a heating circulator and cooling unit it conditions the water to 45ºC to stop condensation on the bottom and to give consistency with the readings. 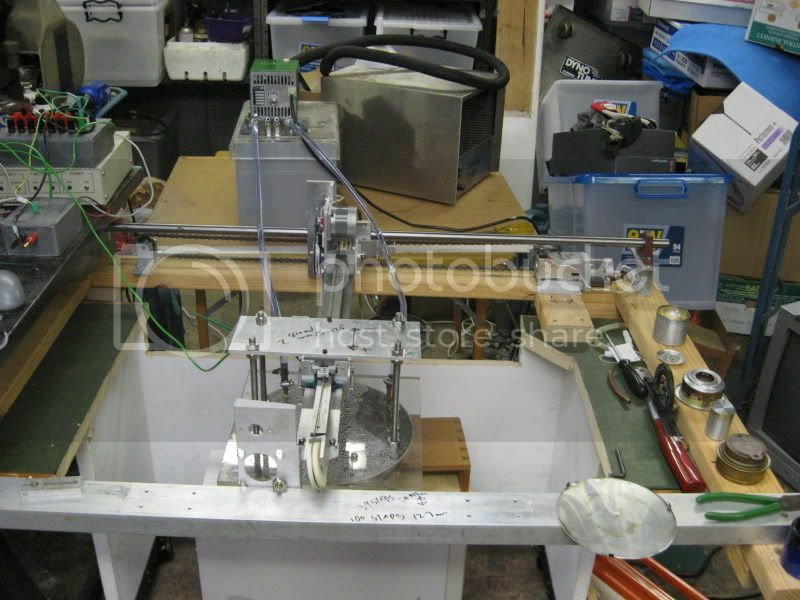 The pot is moved with a computer controlled stepper motors and the temperature probe is a K type thermocouple and the temperature is recorded on a computer. I you want to know finer details I will post more information later. Controlling computers, the one on the left controls the motors and the right logs data, soon I will only need one computer. testing a Kovea supalite stove. 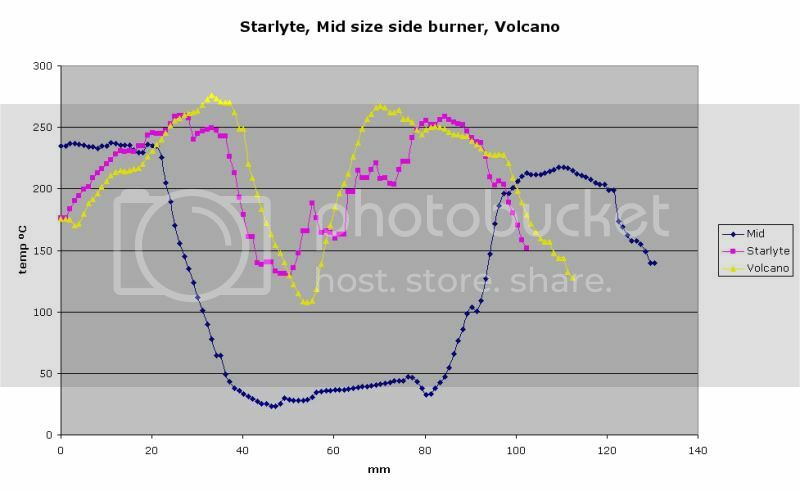 This graph compares a smaller version of the WB which I call the mid box, my Volcano stove and Zelphs Starlyte stove. Sit on stoves but it was not expected to be as much on the Volcano. some good news is that my prognosis is looking good and even though I still have some healing to go I am getting back to normal life. 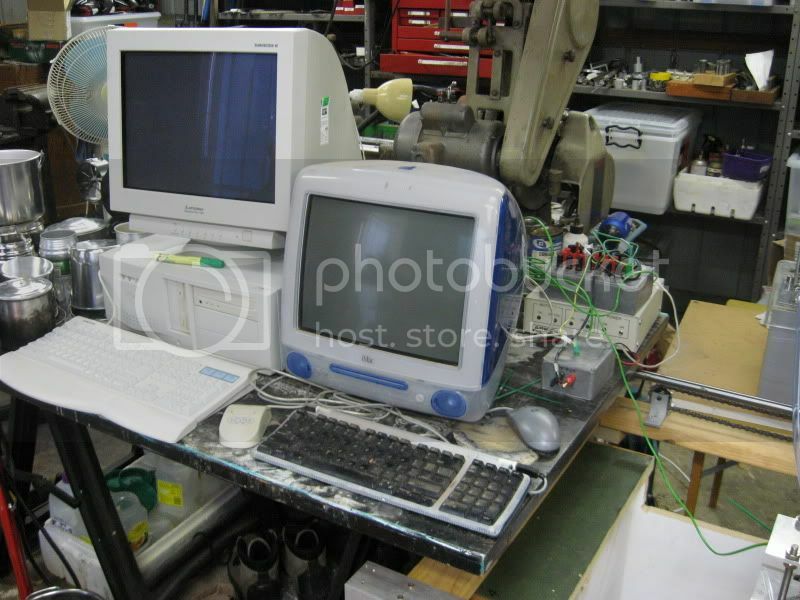 Your profiler seems to be working well, congratulations on the design. 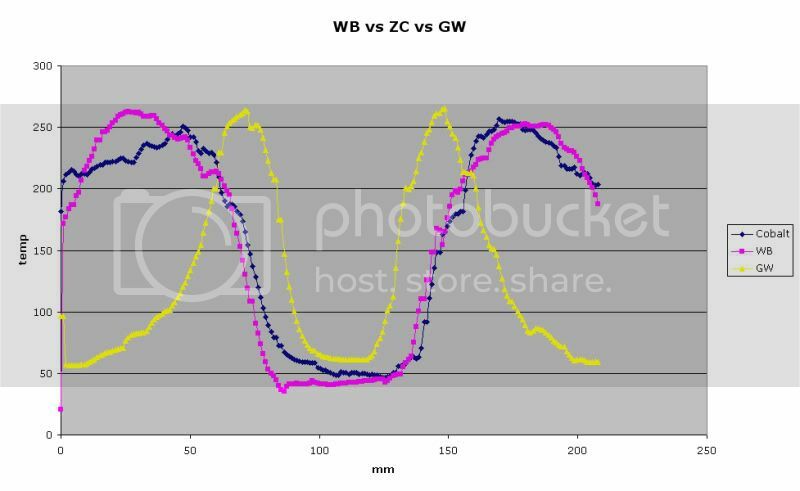 Does the GW stove have a large distance from stove to pot to have such a drastic difference in it's profile compared to the Cobalt and WB? The first scale goes to 250mm and the other only to 140mm, why the difference? Do the flames of the Mid size stove shoot way out from the jets to create such a wide cool spot in the center? Thanks, I am very lucky there are many people much worse off than me. The GW stove is only 35.5 mm where the Cobalt and WB are 59mm, the Gw throws a smaller flame and it also uses less fuel. A good point, the 250mm wide graph is the profile taken across the whole bottom of the pot/heat exchanger where the 140 mm wide graph is taken across the visible flame, I am trying to determine flame size. The Mid stove is the same design as the WB but only 45mm diameter, the cool spot in the center is where no flame can reach but I am not sure yet why the temperature is only around 25ºC, this low temp is not seen on other stoves that I have tested. Yes, that's odd, to see such a low temperature in the center of the pot. It would indicate a much longer time to boil, correct? zelph wrote: Yes, that's odd, to see such a low temperature in the center of the pot. It would indicate a much longer time to boil, correct? I only finished making the mid stove yesterday, I have not tested it for fuel use usage yet I will be doing that tomorrow and I will let you know how it goes. 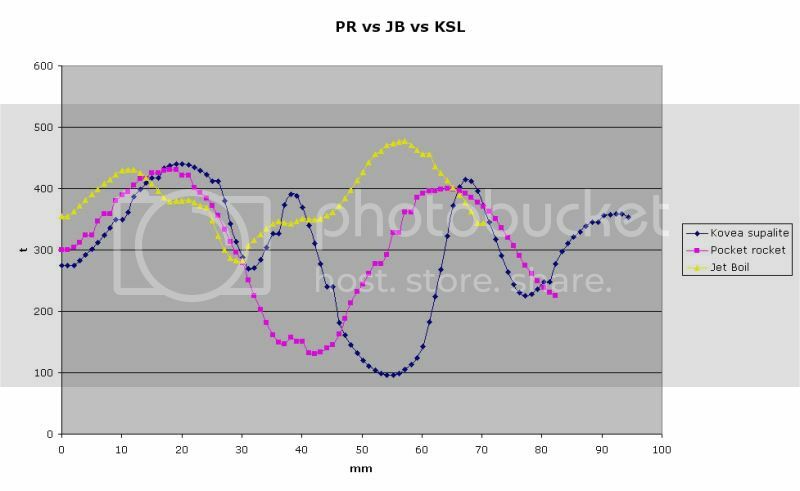 I also have test results for some canister stoves, below is a graph of the flame profile of a Kovea Supalite, MSR Pocket Rocket and a JetBoil stove. Note that the JB stove has a more concentrated flame, the funny wiggles in the Kovea line are caused by the pot supports. The Kovea stove fires the flame out at 45º degrees and the Pocket Rocket and JB put the flame more in a vertical direction. This is really interesting stuff. I wonder how the stoves like the Cone Zone and/or the UL Woodgaz with flame concentrator would show as they seem to focus the flame more to the center. 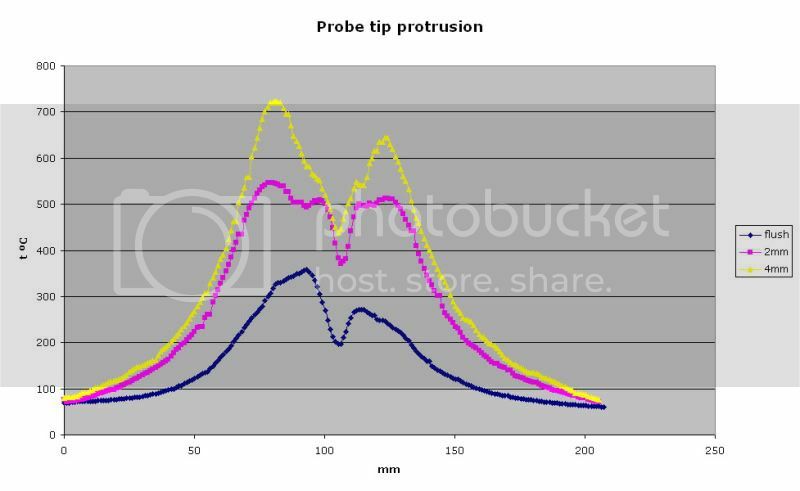 I have done some more development on my flame profiler and now I can do 2D profiles and I thought some other stovies might be intersted in the results. 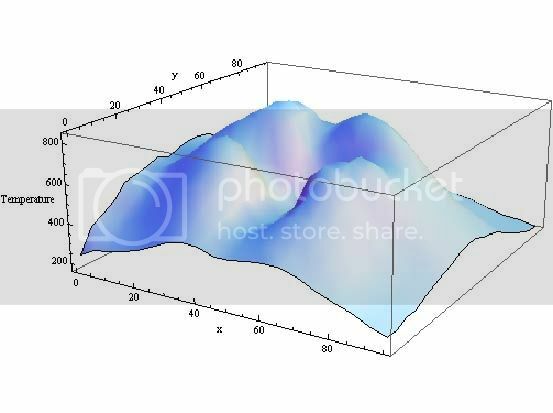 This first graph is of three 1D runs on a JetBoil stove with the probe tip flush with the bottom of the heat exchanger, the probe sticking out 2 mm and 4 mm. Note as the further the probe sticks out of the base the hotter the temperature, this because there is a boundry layer that forms and the hottest gasses do not touch the bottom. 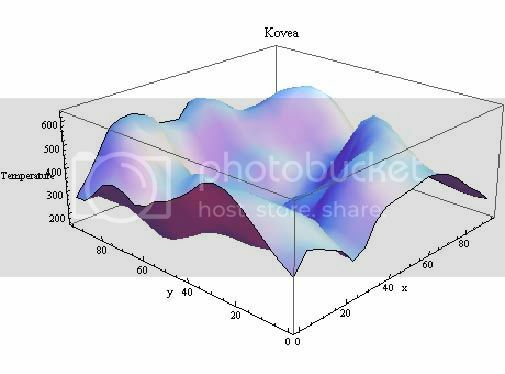 This is the profile of a Kovea Supalite Ti stove, the profile is a 100mm x 100mm grid of 5 mm spacings, then the data was graphed using a program called Mathmatica, note the wave effect of the temperature profiles around the stove, this is from the pot supports, I am surprised to see how much affect they have on the flame temperature. This is the flame profile of a JetBoil stove, not the four high temp points and low temp points, this had me baffled for a while until I remembered that the burner head has a baffle in it with four thick supports, photo below. Ahhhh!!! 2 dimensions are much better Very nicely done Tony. Thanks for taking on a scientific approach to something we have all wondered about at one time or another. The boundry layer has always intrigued me. Can we safely say that all the heating is done by radiation and none by conduction(exception would be the pot supports)? The boundry layer being the thickest at the center of the pot and gets thinner as it goes to the outer edge of the pot. Is the boundry layer that part of the gas which is not burning? zelph wrote: Ahhhh!!! 2 dimensions are much better Very nicely done Tony. Thanks for taking on a scientific approach to something we have all wondered about at one time or another. The boundry layer has always intrigued me. Can we safely say that all the heating is done by radiation and none by conduction(exception would be the pot supports)? The boundry layer being the thickest at the center of the pot and gets thinner as it goes to the outer edge of the pot. Is the boundry layer that part of the gas which is not burning? I know the profiler is real stovie nerd stuff but I am unable to help myself, I expect a visit from men in white coats soon. .
With the boundry layer, you have asked some very good questions and I have to confess that I do not know much about it, I do know that it can be very complicated, some scientist devote their whole careers to understanding the problem, I am about to do some reading up about the boundry layer with respect to flames, I hope I can find something out soon. I think the heating is done by both radiation and conduction.